the airport industry in an exciting, interactive format. of issues affecting the industry today. app from Newsstand, or continue to read your free copy in our web viewer. Subscribe to the magazine for free to get each issue delivered directly to your inbox. 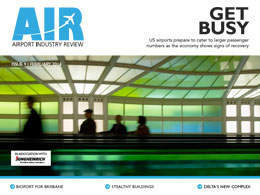 In this issue: Are ADS-B systems secure from hackers? Plus: 3D holographic radar technology, Qatar’s troubled new airport development, China’s emerging destinations, avatars as airport staff, and more. In this issue we explore the latest airport security technology, take a look at Germany’s latest ATC systems upgrade as well as new technologies that promise to streamline baggage handling processes, and find out how aircraft refuelling operations can achieve the perfect balance between speed and safety. We also check in on Brazil’s huge airports upgrade ahead of the 2014 World Cup. Gateways to the world: We find out how today’s airport blueprints merge operational efficiency and cost savings with iconic designs. 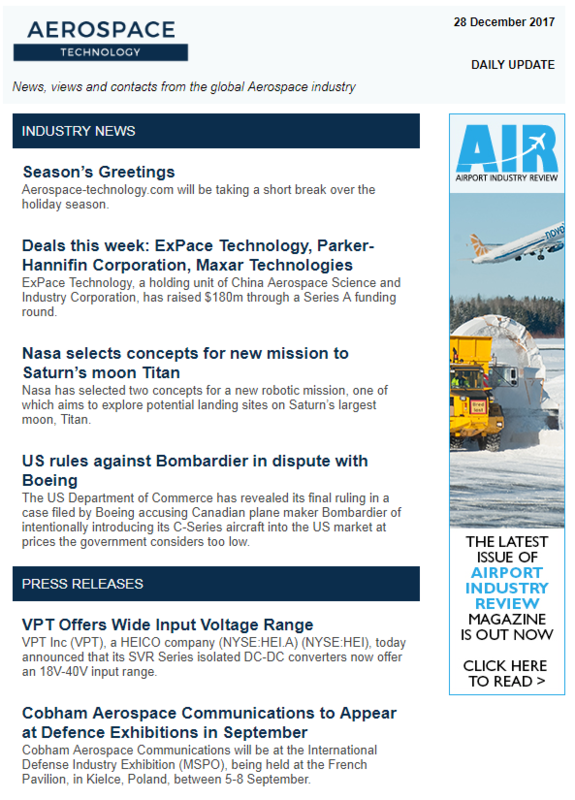 We also look at emerging European destinations, new technology to improve airfield safety, and the technological implications of the upcoming relaxation of the liquids ban on European flights. Our team of search engine marketers are dedicated to continuously improving our clients’ web rankings. Our unique approach to marketing and established techniques have a long history of proven results across all major search engines. Client profiles are continuously monitored to ensure that they are fully optimised and that traffic drawn to their profile is also being directed to their own websites. We have invested heavily in proving the direct value of our web-based services to our clients. 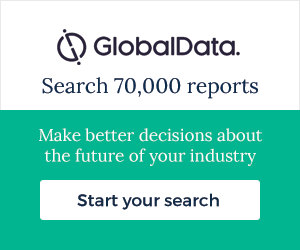 All our websites use the industry-leading reporting software, Webtrends. Our clients automatically receive basic reports containing everything they need to measure the return on their marketing expenditure. In addition, we offer advanced reports for clients that are looking to find out more detailed information to help them with their own marketing activities. The unique resources of Kable harness the power and potential of the Internet. The intensive and continuous promotion of our sites to named senior personnel ensures that they are a bookmarked option for senior management throughout the aerospace industry on a global basis. Advanced search engine marketing and optimisation techniques bring proven results on all major search engines, which direct traffic to our sites and, from there, to our clients’ own home pages. Our policy of continuously updating our websites ensures that industry professionals can rely on our coverage of international aerospace industry developments to inform their decisions when specifying or procuring products or services. 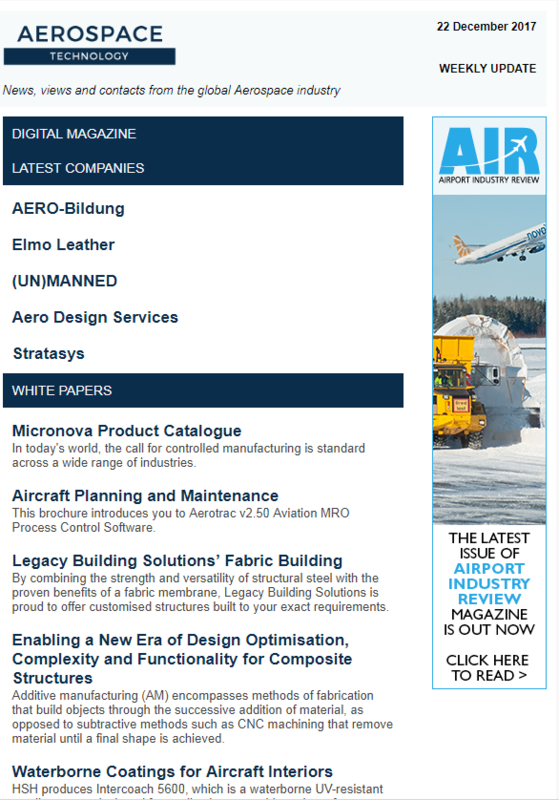 Aerospace-technology.com is regularly used by engineers, technicians and operators from a wide variety of organisations including space agencies and aircraft and component manufacturers. programme, ensure that our database continues to hold the latest information.At aerospace-technology.com, we realise the importance of measuring return on investment. makers through one of the industry’s leading online platforms. news, white papers and the very latest research, projects and features. message, build your brand or sell your product or service. Lantal Textiles is a leading designer, manufacturer, and service provider in the domain of soft interiors for air, rail, and bus transportation authorities around the world. Our presence on the Aerospace Technology and Railway Technology platforms launched by kable Ltd support our measures to enhance industry awareness of our brand, our products, and our services. The profiles have demonstrably directed additional traffic to our website and are generating quality leads. Since LMB Honeywell joined the Aerospace Technology web site, we have seen our Google Ranking results improve dramatically, received some adequate inquiries in term of potential, technical needs & quality of customers, and registered direct orders. This web site fulfils our expectations. we had before joining Air Force technology. We look forward to continuing this trend. Being in the military aerospace industry I think an ad on this web is a must. I’m very pleased with it so far and I’m sure many of the inquiries I get come from airforce-technology. I’m also very impressed with the total number of projects, companies etc. on the web. ABB Automation Systems AB has been present on the mining-technology site for almost two years. We are satisfied with the site and see it as a very good complement to our own site. It is positive that many of the actors of the mining industry are present which makes it attractive for many customers. The result has been several interesting business contacts for us. The Railway Technology website has proved to be an important aid to SNC-Lavalin’s international efforts. The site has helped introduce our organisation to numerous potential clients and partners worldwide, and achieve a significant increase in awareness throughout the industry of SNC-Lavalin’s Total Transit Solution approach to development of transit systems. has found railway-technology a highly international, professional website that has provided us with enquiries and new contacts. Since we have been advertising on it the site has proved to be a valuable marketing tool. Kable websites have provided the kind of large scale Internet presence and visibility that have contributed to making ThermoDyne one of the fastest growing companies in the high temperature insulation industry. The flexibility, service, support and effectiveness of kable and its representatives have been an encouraging challenge to our own marketing staff in striving for excellence, and I have had no reservations about personally recommending their services to associates, vendors and our clientele around the world. Mobilecomms Technology search engine marketing techniques mean that potential customers using the Internet to source their required equipment find our page above all others. As a result, we receive sales enquiries and increased traffic to our own company website and have improved our standing in markets we are familiar with as well as new areas. We are convinced that Mobilecomms Technology is a good medium which can help us in the future gain access to countries and markets we have not reached before. Therefore we’ll carry on using this site The professionalism of the mobilecomms technology team is remarkable and we trust that we’ll benefit from it. We are now entering our third year with Airport Technology. We have found this particular website to be the primary source of enquiries from potential customers. Our web address on the Google search engine has been particularly successful insofar that it is number 1 & 2 on the first page under Air Traffic Management Consultants, all thanks to Airport Technology. We are now being contacted at an increasing pace as the aviation industry starts to pick up from the past two rather quiet years. I should also mention that I use your site to look for companies that can help us. I have already recommended the site to other companies. I feel sure that, as the site continues to develop, it will become one of the world’s primary search sites for the aviation industry and their customers. As one of our subsidiaries, Peiniger RöRo is a company located in Germany, dealing with projects and customers all over the globe. The Internet in general and the Roadtraffic Technology site of kable in particular have provided us with the means to inform our customers about our services on a more efficient and economical scale. The Key Word Search Function is an interesting feature we have come to appreciate as an option that will give us a leading edge going far beyond search engines as such. Heflin Steel Division of the ESCO Corp.
We are very pleased with the service Army Technology provides. Potential customers are able to cut through the internet clutter, and find our information right away. I would encourage any company with a product or service of interest to the defense community, to consider listing with your site. Kvaerner Eureka is a Norwegian Company within the Defence area. Our Customers are located all over the World. In order to reach the international market with our services and products in a cost-effective manner we are, among other things, using the kable website “Army Technology”. Our experience so far is very good. We have received enquiries from existing customers as well as potential customers. Our advertising at the Army Technology website is a part of our advertising strategy, and as long as it is beneficial for our company we will continue to use kable websites. OWR is the leading specialist in NBC protection, detection and decontamination. Since OWR’s founding in the late 40’s we have supplied safety equipment, special vehicles and decontamination systems to the military and civil defence worldwide. Working with kable has been a substantial part of our online marketing strategy. With Kable’s worldwide reach we have increased business with existing and new customers. The NBC equipment section is a good reflection of the industry, something no other website has yet provided. We are looking forward to continuing our business with kable in not only increasing business, but also awareness of OWR within the NBC field. Army-Technology.com provides Gichner Shelter Systems with high quality exposure to our existing and potential customers. Our participation in the web site is a significant part of our online marketing strategy and directly supports our own internet activities. We get solid, well qualified referrals which are helping fuel our growth in the worldwide tactical and logistical shelter market. Army-Technology.com is also helping us increase our brand recognition outside our core market area and has proven to be a valuable sales and marketing tool. PCI has given our company the opportunity for the highest level of exposure on a global scale. kable is a first class company that exemplifies the highest levels of professionalism. Global Armour has been working with Army Technology for over two years and have found their site to be an invaluable part of our marketing strategy. We have gained new agents through their web site and also won our largest single order from a direct enquiry generated by Army Technology. Thanks to PCI we have gained many leads in new markets. This really helped to portray our brand and new technologies! Turner Designs Hydrocarbon Instruments, Inc.
Turner Designs Hydrocarbon Instruments, Inc. manufactures oil in water and oil in soil analyzers for the offshore market. Our primary customers use our instruments for produced water discharge monitoring. We make both hand held oil in water analyzers and continuous on-line monitors. We launched our new TD-500 hand held oil in water analyzer 2 1/2 years ago on the Offshore-Technology and Hydrocarbons-Technology websites with emphasis on press releases and technical details. By far, our investment in both web sites has been the most fruitful of all our advertising dollars. We receive a continuous flow of highly qualified leads from both web sites generated by customers seeking solutions to problems our instruments solve. I always recommend your kable web sites to my colleagues in the industry as the best place to showcase their products. As we grow into other markets, we plan to use other kable sites to promote our products. Thank you for your great products. Being active in the Offshore Oil and Gas industry ALSTOM Power has found offshore-technology a very useful, professional website that has provided numerous enquiries and new contacts internationally. The site has proved to be a useful marketing tool for us covering our relevant topics and projects. PCI has provided Packsys Global with great branding and market coverage to the the global packaging sector. As a company they have always operated with a high level of professionalism. For us, Packaging and Converting Intelligence is a professional platform of international stature that helps us present our innovations to a global audience. The experience of being part of the publication has been a thoroughly enjoyable one, PCI provides a first rate service in terms of product and professionalism – we look forward to doing more work with you. in the DesignBuild Network and IDBI magazine a necessity. It helps make sure that we stay in direct contact with the major organisations around the world. It has proven to be a most reliable source for generating new business contact for us. LEAF Contractors gave us the opportunity to strenghten our knowledge by networking and sharing experiences. Very interesting formula, lots of new material. You guys have done a fab job. As a result of the investment we have made in this opportunity we have had a number of UK MoD enquiries,one of which has resulted in a potential order. The web site has been a very good way of getting our name and cooperate information in front of many influential people within the UK MoD as well as associated defence companies. The contacts I have made over the last 3 days will be vital for my business in the coming years. Perfectly organised, highly efficient. Great atmosphere. We were very impressed with the report, thanks. Thanks for all the support, we are very pleased with the supplement. Very pleased with the quality of the magazine, wraparound placement of the ad/article and timely distribution of copies. Thank you! Very professionally prepared and published. Our content was very well placed, laying a focus on our capabilities. The CEO team worked in a professional manner and were very good at keeping up with their clients’ needs. As a leader in the field of inventory management, enabling companies to trade surplus stock for procuring media opportunities, Active International is proud to have participated in Finance Director Europe. This journal offers an important pulse on initiatives and innovations for the European CFO community and provides excellent ROI. A series of promotional editorials by Active International in 2004 and 2005 generated sales enquiries and expertly conveyed our message. Kable provide a quality service enabling us to make contact with many potential clients. Thanks for sending me a copy of Medical Device Developments, in which we find our company’s advertisement on page 83. I’m very much pleased with the quality of the advertisement and the placement next to the article Device packaging developments. Avicenna Technology Inc is pleased with the results from its participation in the 2004 edition of MDD and has renewed for the 2005 edition. The volume of high quality responses from the world over has exceeded Avicenna’s expectations. The method by which these responses are forwarded is thorough and timely. SCHURTER’S advertisement in MDD 2004 provided several of our customers within the medical appliance sector to access our company and product information. We appreciated the high quality responses that enabled us to demonstrate our competence herein. Proceeding with this announcement is the logical consequence. W.C. Heraeus is pleased with the results from its advertisement in the 2004 edition of MDD and has renewed for the 2005 edition. The service by which these responses are forwarded is thorough and timely and the feedback from all over the world has exceeded our expectations. LASAG Industrial-Lasers is pleased with the feedback of our advertisements in the Medical Device Developments. Participating since many years, we very much appreciate the professional service of the MDD team. We are looking forward to the 2005 edition now. The European Commercial Real Estate Group at Deutsche Bank, a leader in European commercial mortgage lending and CMBS, was very happy working with FDE. The editorial process and their ability to adapt to changing timetables and requirements was very good. FDE’s feedback in terms of reader inquiry related to interviews and hits on the FDE website were very helpful and informative. This provided a real measure of the impact of the pieces which is usually sorely lacking. I found the content to be absolutely wonderful. These types of publications usually only keep my attention for a few minutes, but IT Leadership got my full attention and I read it cover to cover. Great job and keep it up. Attending LEAF has proved to be a very worthwhile experience. LEAF has improved every year. Keep up the good work. LEAF has exceeded all my expectations. The evolving changes that are underway in how industry finds and develops new energy supplies are creating a new reality for all of us – a reality that presents significant challenges and places a premium on sound management systems and decision making…The response to these new challenges is technology. Technology is the lifeblood of our ability to pursue opportunities in new geographic locations and ever-harsher climates. Working in the mobile communications industry, 2N has found Mobilecomms Technology to be a professional and successful site that has provided us with new contacts and sales leads throughout the world. I was pleased that LEAF-Contractors exceeded my expectations. I can’t think of any improvements that need to be made. LEaf is valuable for making new contacts and maintaining old contacts. My team and I are very impressed with the CEO publication. Thank you, Martin. I appreciate the work you’ve done to support us as an advertiser and supporter of CEO. It has been a good and worthy investment, and we will consider other opportunities with you along the way in the future. When launching our assembly dedicated modular MES solutions for optimised process control and life cycle management, choosing Medical Device Developments as our long-term global partner has proven a timely, well judged decision. We hereby confirm that we subscribe to the web-page ship-technology.com, and have done that for some years. We are very pleased with the response we have had, with a lot of interesting inquiries. Some of the inquiries has even led to contracts for delivery of lifeboats and rescueboats. We can highly recommend this web page to other manufacturers. I found your publication to be insightful and well-written, and I appreciate the executive level presentation and brevity. Very positive – please invite me again! This is the third time at LEAF. It is more and more interesting each time. Competitiveness will be determined less by sheer size and asset holding and more by agility, speed of response, and capacity for innovation. Packaging Gateway has been an integral part of our online marketing campaign.It has helped Royston Labels achieve high visibility on the internet with top ranking results on the all the major search engines and therefore increased traffic to our page.We have also had excellent customer services with our account manager providing us with continued support throughout the year.I would happily recommend the Packaging Gateway web site as a valuable marketing tool. The forum was an excellent use of our time and resources and allowed us to spread the word on Centria to a quality audience of decision makers from the international architectural community. It was great to see that the architects there were as eager to learn from us as we were to impart our product knowledge. The organizers have to be commended for inviting a quality group of architects for whom the event must have been as worthwhile as it was for us suppliers. Knapheide, is one of the the leading German manufacturers of a variety of hydraulic system-components including high-pressure hoses for mining and industrial purposes.We are pleased to state that we are very satisfied with the performance and our presence on the mining-site. We have been on the site for five years and our export-quota has gone up from 8 to 15% . This is to a great extent due to the contacts & visibility made via this professionally managed site. For us, being part of the Packaging-Gateway.com website is a perfect option to present our products and innovations to a global audience. Packaging Gateway provides a first rate service in terms of product and professionalism – we look forward to doing more work with you. Food Processing Technology has been an integrated part of our online marketing strategy within Food and Dairy for more than one year. This has lead to increased enquiries and contact to customers we have not been in touch with earlier. We have also had excellent service from our account manager who continously keeps us updated and provides us with support and suggests new online activities in order to have the best possible online appereance. We are happy to recommend Food Processing Technology as an integrated online tool. DORCE Prefabricated Building and Const. We at Dorce Prefabricated Building and Construction Ind. Trade Inc. are very pleased with the service Army Technology provides. We have recieved so many enquiries from Customers and it has also helped us increase our brand recognition outside our core market area. Real life experience, linking M&A to shared services/BPO support. In general the site has been very useful tool to promote our products and to establish representatives for our products in other countries. GSF was extremely valuable in developing new relationships with key decision makers in our industry. It was well organised and a very efficient use of our time. We will definitely attend again next year. It is a great opportunity for all the people in same industry to meet and know each other better in short time. Very well organised event…one-to-one meetings very useful. Excellent interaction with key industry suppliers. Valuable and productive meetings with the RIGHT people in the industry. Much more focused on the semiconductor industry than other events. A very warm welcome and great ‘get-to-know-each-other’ activities. Quick access to remote suppliers with follow-up arrangements. Interesting opportunity to improve networking with suppliers and delegates from different IC industries. An intense opportunity to meet customers all in one location. Useful for me to meet smaller suppliers I’ve never been exposed to with an interesting view of Asia’s coverage by suppliers. Good programme that provides an excellent opportunity for networking with my peers. Good gathering of leaders in the industry! I believe this is a GREAT business model. Excellent networking for running and future business. Due to the fact the Kable team was really very involved in the time after the formal business we stayed more together ‘after business’. Due to the format this forum is A BREED APART, meeting format is great. I was very pleased with the pre-arranged meetings. A very informal way to conduct formal business. Excellent opportunity for one-to-one meetings, good quality of buying influences. Some useful new business opportunities to be explored. This is third year that our company has a profile on Ship-Technology. During these years, we have became a recognizable name on the market for metal furniture producers. Several companies have contacted us through your website and many are now regular clients. All that was possible thanks to our advertisement on Ship Technology. We are satisfied with the cooperation from your company and our profile will stay on the website in the future. We also have a profile on Naval Technology which helps to expand the number of clients. We can highly recommend your website to all companies, especially those who have just started their business on the marine market. The Army, Navy, Air Force and Aerospace technology profiles are extremely helpful in researching the Defense Industry, domestic and international. When searching for information on defense products or suppliers the pages rank very highly within search engines, making them easy to find. Overall this is a great tool for researching for competition or potential collaboration. Over the past four years Biwater has found Water Technology to be a great marketing tool and source for new enquiries within the water industry. A really easy and comprehensive site to access and a definite recommendation for increased online visibility. We manufacture transdermal drug delivery systems and medical grade films, liners and laminates for the medical and pharmaceutical industries. We have been using pharmaceutical technology for at least two years as a way to increase awareness of our capabilities and drive relevant traffic to our web site. We would recommend this service to others as a valuable resource for pharmaceutical information. We are a Softgel equipment supplier for the pharmaceutical, nutraceutical and cosmetic industries, and have been on the site for over three years. We have received numerous enquires from this source and would recommend the site to others. Army Technology has really helped our drive in spreading the word across the defence market. A great tool which is leading to vehicles being sold throughout the year. We produce fruit and vegetable ingredients for the global food industry. The assortment comprises juices, juice concentrates, purees, concentrated purees, compounds, IQF fruit, and Verifruit� (infused fruit). We have been on Food Processing Technology for two years. The company profile has helped increase our brand awareness and traffic to our website. I would recommend this service to others as a valuable resource for food processing information. 2001 was the year in which Saia Burgess Gateshead Ltd started advertising within Medical Device Developments and the relationship is as strong as ever. We continue to advertise because the publication is strongly and accurately focussed on an important market for us. Medical Device Developments has enabled us to keep our product in front of our customers and penetrate the market to a greater degree, facilitating response from new customers. We are very happy with the presentation, content and professional services delivered. Saia Burgess product portfolio includes very quiet linear motors with a reliability and precision second to none specifically designed for the critical care environment. GSF2005 was well organised with meetings being kept on track and providing a good opportunity to meet with key decision makers. A fairly unique event! I would like to extend my thanks to the team for making this a beautiful entry. The event was a great success – extremely well-arranged and time very well spent, superior to other events that we have attended. It is a very unique event and provides significant value to participants. I am currently in the process of starting up an Airline in Europe. I am sending you this Email to request information about one of our potential aircraft types, the Embraer 170/190. We are currently talking with Embraer about becoming a potential customer for this aircraft, and we understand that this type is operated and maintained by XXXXXXXX, and as such, we wish to ask a few questions about this, as we would consider ourselves a potential customer for XXXXXXXX’s technical services. 1. For competitive reasons,How does the cost of operating the E170/E190 compare to the A320 series aircraft? 2. Was there any problems encountered with the aircraft’s entry into service (EIS), and if so, how were these solved? 3. How good is the aircraft’s dispatch reliability? If there are any questions, requirements for cost analysis, or any other issues that your team has for us, please contact us on this email. We are an EASA Part 145 approved company in the Netherlands and maintain a Cessna 501 business jet. Via our sister company XXXXXXXX at Schiphol airport we are informed about a system of Sikkens aerospace which cover/restore bounding sealing/paint cracks for instance at the top of wing areas. They tell me that these systems are used for the bigger planes. My question in this matter are you familiar with this system (flex joint bounding)and is it useable for the smaller planes like the Cessna 500? Pls can you inform me? How would we start working on getting a quote for leather refinishing of the seats in our aircraft? We have a single engine Grumman Traveler. We already have the aviation leather hides in our color choice – 12 hides way more than we needed but we got them – each tagged with the aviation leather sticker. We had nothing to base our cost for the project so we put aside $1,000 for the labor to redo the seats in leather. We are looking for a quote on a ******** battery system. The application is a Morane Saulnier (SOCATA) MS-760 Paris Jet. We have a rebuildable core. ***********, based in Latvia, have an interest to buy one set of tourist class passengers seats for installation on Aircraft Airbus 320, total quantity of seats 180, estimated pitch 28″-29″, 60 blocks, 30LHS and 30RHS, estimated time of installation February 2004. It will be gratefully if we can purchase second hand seats or refurbished. Three-seater passenger seat, which can be transformed into two-seater (35 triple blocks). European company looking tor wet lease for one year, starting as soon as possible. Aircraft required Fokker100 PAX. If available please contact the unbdersigned for full details. dear sirs, we are looking to purchase 3 wheels with mentioned part, could you advise if available, condition and price ? I would like to send you an inquiry for a 400 Hertz system for the ******** Airport expansion project. Please reply back as soon as possible of the possibility of your company sending me a quotation. I have a client that is interested in cabin and flight deck cctv with digital monitoring capability. They have a range of aircraft but at this stage interested in 747 compatibility. If you have these systems could you please send me technical specs and product overview info with costs. Also some background on your company. Interest may expand to Airbus series and 767 aircraft.